These posts are some thoughts on what’s happened in Grandpa Guy’s life, and how those experiences influence what he does today. I love to read, and usually dislike reading a book again. For me, even favorite books lose their excitement the second time around. That made studying a little difficult in college. My vision of studying included going over the same material again. This boy wouldn’t do that, much to the chagrin of my study partners. During my junior year of college we had a particularly difficult test coming up, and my buddy Dean felt that he needed some help. I knew that my recollection of the material was not good enough, too. We decided to spend the evening studying. I couldn’t do it. Going over the material again was too boring. We had lots of other things to talk about, so we did. Dean didn’t do well on that test. Back to the books. I can count on one hand the number of books I’ve reread. There are only a couple that I’ve been through more than twice. As I think about that short list of books, I’m drawn to reading some them again. Other favorite books (Phi, for example) changed how I view the world, but I don’t need to go back. Allow me to take another diversion here. I love reading, but I don’t like to reread a book. Movies usually bore me. We go to a movie every couple of years. Not interested. The interesting part? I can watch my favorite movies or television shows a dozen times. I can bring up scenes and dialogue from Casablanca in an instant. My biggest television addiction (addiction being something I must do that has no direct benefit) is M*A*S*H. I’ve seen every episode a half-dozen times over the last forty years. Judy leaves the room when I’m watching M*A*S*H, because I can speak most of the lines with the cast. Down in our basement are several big plastic tubs. If you took the time to open one of them, which I haven’t in years, you might find dozens, maybe hundreds, of N-scale model railroad cars, buildings, engines, and miscellaneous equipment. Poke around in my home office and you would discover more trinkets, track, and a half-built modular section. The other day my friend Jay and I were talking at coffee, and we got on the subject of trains. 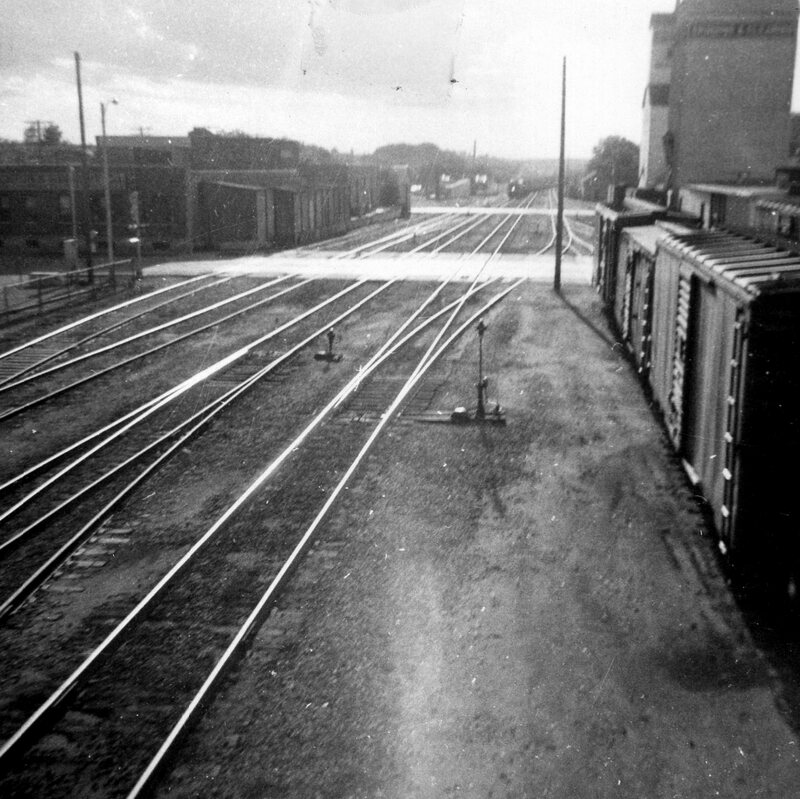 Railroads held an important spot in our lives in the fifties. If you wanted to travel any distance, it was probably on the railroad. Both he and I had taken significant trips by train. The little house we lived in until I was about ten was across the river from a railroad branch line. The line served the ice house (now there’s a whole ‘nother topic! ), a lumber yard and a couple of other businesses downstream from our house. That line was important to me, especially during the winter when the river froze over. We’d walk across the ice, clamber up the steep river bank, and the follow the tracks for a block or two on our way to school. If we had a spare penny, we’d leave it on the track in the morning, hoping that sometime during the day a train would come by to flatten it. I wish I still had one of those big pennies. If we followed that branch line another three blocks north, we get to the Northern Pacific’s freight sorting yard. The yard extended a block or two east, and at least a mile to the west. To the east was downtown, where I found interesting equipment and operations, especially exciting for a boy who would become an electrical engineer. 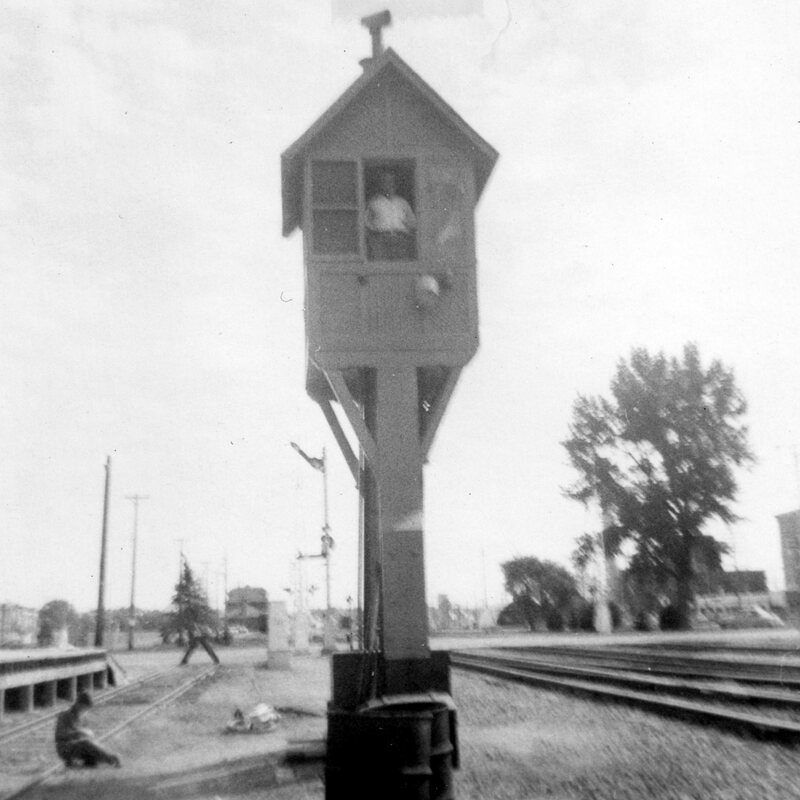 Just off First Avenue was a wooden tower, probably twenty-five or thirty feet high, with an operations room at the top. There were two or three men in the room, watching for trains. When they saw one coming, they’d operate switches and levers to activate the crossing signals that held car traffic on the avenues. What a great winter that was! We had taken up cross-country skiing a couple of years before. On most weekends, and not a few evenings during the week, we’d head out to a trail to enjoy the winter scenery. Judy and Guy on cross-country skis. One of my favorite outings was the “Mantorville” trail. One of the local ski clubs had worked with landowners between the village of Mantorville and the county park just north of Byron, Oxbow Park, to mark off a ski trail. Somehow, they had found a dozen miles of forest, plains, trees, ponds, and hills unmatched for beauty and skiing fun. My friend Bill and I could easily finish the trail in an afternoon. Winters were more winter-like in the seventies. The snow came earlier, often by Thanksgiving, and stayed later, sometimes skiable into March. The best weeks saw a cold snap mid-week, a couple of inches of fluffy snow on a Thursday afternoon, then a dusting of snow Friday night and brilliant sunshine on Saturday morning. We didn’t even care how cold it was if there was new snow. It wasn’t just the Mantorville trail, either. The trails at Whitewater State Park were even better. Hundreds of square miles of bluffs covered with state forest. Big hills and incredible vistas. Even local golf courses were fun to ski on a dark winter night. We always had someplace to go skiing. When a long weekend demanded better skiing, we’d head off to someplace exotic, like Grand Marais, on the North Shore of Lake Superior. New vistas overlooking the lake. Fantastic rivers frozen into magic. Restaurants we’d never been to. Those were some great winters. We’d planned a day of skiing for that Saturday morning in February of 1978. Friends would take our baby boy for the day. Everything was perfect. Except the weather. It got ugly. Sunny. Warm. It started Friday and didn’t get any better the morning we were supposed to head out to the trails. Warmer by the minute. There would be nothing but mud in the fields by the time we got going. Oh, that’s disappointing. Have you noticed that for each person you know, each of them has a favorite topic for discussion? One wants to talk about politics. Another is deeply moved by personal finance. Some need to talk about family relationships. Other things do come up during the discussion, but it always feels like we’re circling around what it is they really care about. For my friend “Clare” the topic is religion. Fortunately, I love talking religion, especially with her. I am a novice. She’s a pro. There is so much for me to learn, especially when I’m trying to explain how I feel. At our last meeting, for her father’s funeral, we talked about “the dash.” The summary of a person’s life chiseled into a tombstone. You’ve seen it. That’s more than eighty years reduced to a single mark in a stone. It’s up to us to fill in that tiny space with our understanding of a lifetime. As the talk moved on I related that every time I recite the Creed during a church service, I am reminded of “the dash.” Except that it’s a comma. An entire life reduced to a comma. A life that changed my life, and the life of the world. Where’s that comma, you ask? I had no idea. Absolutely none. On that warm April evening over forty years ago friend Rick and I stepped off the elevator into an unknown. As that unknown unfolded I realized how wonderful life could be. Coming from an uncomfortable relationship that had ended uncomfortably, I needed something. I just didn’t know what. We climbed into a car with you and your friend Deb. On that spring drive around town you wowed me with your ability to hold me enthralled in conversation. I was captivated. We could have talked the evening away, and after that evening we often did. Who could have guessed that after all these years and changes I’d still want to sit quietly and talk with you? The list of people who want time with me seems endless some days. I could have lunch or coffee with someone different every day. Beautiful people; educated, challenging people. All can hold me in discussion. For a while. After time with all the others I cherish an evening of just us. Sometimes it’s an evening out. A burger … or soup and salad. Maybe it’s time at home, with something we cook together. It really doesn’t matter where we are, even if we just head out for a drink at the Doggery. If it’s time for us to talk, it’s the best time. Nobody holds my attention like you do, even after forty-plus years of Valentine’s Days. Who knew? I sure didn’t. I love you. Absolutely you. I’ll think of something to say soon. I’ve been blessed with a wonderful life. I am surrounded by a loving family, and dozens of great friends. There’s always something going on, from reviewing the Clinic’s research to helping Judy in the RavensFire band. Most days our house rattles with the noise of grandchildren. A couple of times a week someone wants to meet for coffee, lunch or dinner. I’m blessed. Forget those bad things, I need to get back to one of the hobbies that has eluded me for over six months. This blog. Since the first of the year I’ve been writing, looking at Jim’s diary, searching pictures, and reading old letters from my aunt Esther. The blog has made it to the top of the list again! Perhaps I’ll reorganize the site a little, rewrite some of the older posts to add interesting comments, and regularly add more stories of my own. Thanks for your patience until I get back into the swing of writing and posting regularly. You will see more here shortly. I’m feeling better about it already! Radio was different in 1961. I had a brand new pocket transistor radio. According to Wikipedia, the radio probably cost me about twenty dollars. Adjusting for inflation, that’s well over a hundred of today’s dollars. My memory is foggy on where the money or the radio came from, but having one of those little Zenith radios says something about my interest in technology. Jamestown had only two radio stations in those days. KSJB and KEYJ. Both are still on the air, but now there are many more. That summer I listened to a few baseball games, but they didn’t hold my interest. Roger Maris was almost a local boy, but that wasn’t enough. KSJB played top ten hits, which did catch my interest. I collected their weekly Billboard Top Ten sheets for years, saving them for decades. It took a while for me to get my first RCA 45 RPM record changer, which allowed me to start buying those top ten records. Nat “King” Cole got the honors of the first record I ever bought: Those Lazy Hazy Crazy Days of Summer.